I like war romances. The thought of two people finding love in a time of fear and danger really appeals to me so I was quite looking forward to reading this novella. Aiding the Enemy had an interesting premise and it was interesting enough but I couldn’t help feeling that there was wasted potential here. This book is a short, fluffy romance that lacked some depth but for the most part it was fine and as a novella it ticked all the boxes. My problem with this book was that it could have been so much more. I would have really loved this as a full length historical romance novel, I think it is really what the story deserved. The fact that it is a story about a German Doctor and an English nurse who fall in love is enough to justify a longer length. On top of that there were so many other elements that really needed a little more space. It all felt a little condensed and rushed. A lot is pushed aside to get the romance in and a lot of the romance is underdeveloped to get the plot in. The romance also felt a little forced (again due to the length) and I failed to feel the chemistry between the characters. The writing was of a good standard. Rowe has done a nice job with the descriptions and atmosphere of the story. She made the war time hospital sound horrific and some bits are definitely not for the faint hearted. The characters were alright. I liked both Rose and Herman but I didn’t love them. I found their voices to similar and I struggled to notice any cultural differences between them. 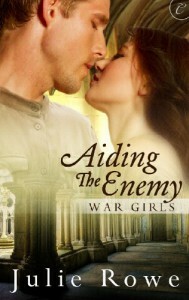 Aiding the Enemy is an entertaining enough novella that kept me interested but it had the potential to be a lot more.